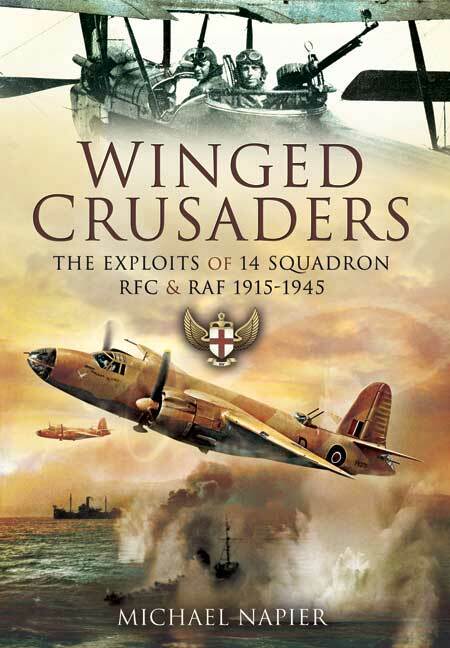 You'll be £4.99 closer to your next £10.00 credit when you purchase Winged Crusaders. What's this? Formed in 1915, and still operational today, 14 Squadron is one of the RAF's longest serving and most senior Squadrons. Spending the first thirty years of its operational life in the Middle East, the history of this Squadron is a rich one, but one which, until now, has gone largely unrecorded. Napier effectively brings together all the historical scraps and shreds of stories which make up the collective history of this unit, from 1915 -1945, a period of great military and social upheaval. The author himself attests to the fact that the work is not merely about the aeroplanes operational history during this period, or the stark military facts (although enthusiasts of both these areas will find much here); rather, the work concerns itself to a large extent with the people who flew such aircraft. Recording the dramatic trials and tribulations of the people who were 14 Squadron, Napier provides a sympathetic and engaging account of this period of Military History. Well written, with a healthy compliment of maps and some great colour pictures of numerous aircraft types flown on operations. The author effectively brings together all the historical scraps and shreds of stories which make up the collective history of the 14 Squadron RFC & RAF, from 1915-1945. Napier's book is a model of what a squadron history should be. Well illustrated chapters fully describes the unit's activities not only through the First and Second World Wars, but also the inter-war years when it flew operations in Transjordan and Palestine. Napier's well-written text is complemented by extensive footnotes and appendices, including a very useful list of references and all the aircraft flown during the period covered. This excellent book will appeal to former squadron members, historians and modellers alike. A well-written and, within the constraints imposed by its page count, comprehensive narrative account of the history...It is admirably detailed. This is a well-written account by the Hon Sec of the 14 Squadron Association which is full of detail and illustrated with a good selection of photographs and maps and is recommended to all with an interest in RAF squadron histories. The detail contained in this new book is impressive and covers a wealth of new information and illustrative material which has been collected together from official and private sources after an extensive period of research… This book is much more than a reference book for enthusiasts. For historians it provides a thorough insight into the people, the inter-service politics and the military policies throughout two world conflicts and a continuous inter-war period of overseas air policing…The way that the squadron operated during its WW2 days in desert sweeps and on missions against enemy land and sea targets makes for a very good read, supported by relevant wartime photographs that are fully captioned. 14 Squadron has had a rich and varied life and until this book was produced its history has been generally unrecorded. The author has done an excellent job in organising the historical scraps of data and unit stories and has produced a superb collective history for this unit. The period covered spans era of great military and social upheaval during which aviation and technology is radically evolved. This volume is not just about the aircraft, the operations and the stark military face of this squadron unit it also reflects both the aircrew and the ground personnel. It is their story and the author brings to life their personalities. The trials and tribulations of the squadron’s personnel are recorded – they are what made 14 squadron. The book is essentially split into an introduction, nine chapters and three appendices. Each of the chapters covers a different time period (between 1915 and 1945) and operational theatre. The three useful appendices cover the aircraft operated (by 14 squadron) between 1915 and 1945, the squadron’s aircraft markings (1915-1945) and the squadron history references. This exciting book is packed full of data on the squadron and it is an excellent account of its history. The author’s work is an exceptional and this is the must have book on 14 squadron. The elder son of an army officer, Michael Napier joined the RAF in 1978 and served with 14 Squadron as a Tornado pilot in the late 1980s and again in the early 1990s. These two tours engendered a deep interest in 14 Squadron’s distinguished history. He was appointed as Honorary Secretary of the 14 Squadron Association in 2003 and since then has carried out extensive research into the Squadron’s heritage. Michael, who is now is an airline captain, lives in the Cotswolds with his wife and two children.